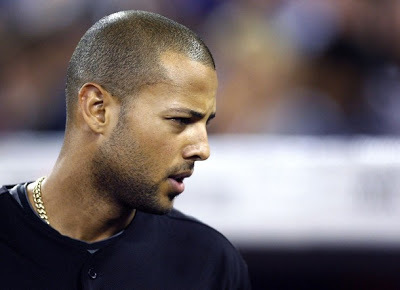 &nbsp &nbsp &nbsp &nbsp &nbsp Asking price: Alex Rios to come back to the Blue Jays. Is unwavering optimism part of the trade, too? I'm beginning to fall deeper down into this state of Jays apathy into full blown depression. i'm slightly comforted by the fact that my Rios figurine broke in a terrible figurine falling off the top of a tv accident. and be careful, last time i put a picture of bobbleheads up i ended up with a guy e-mailing me non-stop for 3 weeks trying to buy my Corey Koskie off me. I would love to have your figurines of Alex Rios. I would like to put them next to my figurines of AJ Pierzynski, who like Rios, is one of my favourite players. Matty, the bat off my Alex Rios figurine broke and no longer screws in properly. I can imagine that someone wanting a Corey Koskie bobblehead is a diehard fan. QJays, now that Rios is gone I don't think I could part with my figurines and bobbleheads. At least I can look at them and remember the good times that Rios gave us. I'd hold on to those puppies, though they would be an excellent addition to my giveaway collection. I'd put it right next to my Frank Thomas Bobblehead. Sounds like you should start a collection of former Blue Jay bobbleheads. I think there's an Eric Hinske bobblehead floating around out there somewhere too. I wish Rios was still a Jay! That Hinske bobblehead has to be huge. Biggest melon in MLB. Actually, I think there might be one bobblehead with a melon bigger than Hinske's – Kevin Mench. Oh, yeah. If anyone wants the Mench bobblehead, I have all 10,000 of them. Got them out of the dumpster — not a single person showed up to the game where they were giving them out. QJays, just wait for the season when Mench hits 30 HR in Japan, and then you'll be a millionaire with all those Kevin Mench bobbleheads!